"As you go out in mission, the Lord is calling you to a ministry of servanthood," Anglican Bishop John A.M. Guernsey told graduates of Samford University's Beeson Divinity School Wednesday, May 7. "The Lord has put a particular call upon your life to preach Christ crucified and at the same time to witness to His sacrificial love through the heart of a servant," Guernsey said. 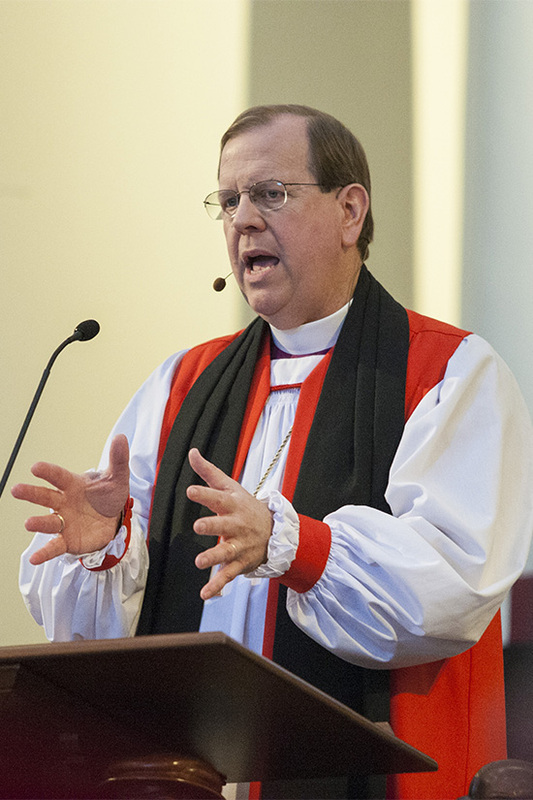 Guernsey, bishop of the Diocese of the Mid-Atlantic of the Anglican Church in North America, shared five hallmarks of the mission of the Church that he believes should be in the life and ministry of the Beeson Class of 2014. Those hallmarks--prayerfulness, going out, holiness, dependence on the Lord and empowering by the Holy Spirit--stem from Luke chapter 10, in which Jesus appointed and sent 72 forerunners to prepare the way of the Lord. Prayer, Guernsey said, is key. "Jesus tells us to pray before He even says, 'go,'" Guernsey said, adding that prayer must be central to everything in mission. Pray for those you know, pray for opportunities to share Jesus, and pray for the needs of those you meet, he advised. The second hallmark is "to go, to take the initiative, to reach out," he said, encouraging the graduates to not hesitate to jump into unpleasant situations when necessary. "We follow an Incarnate Lord who has plunged into the muck of our world to rescue us. He's not aloof, uncaring, unwilling to get involved. And as the Father sent Him, so He sends us." Humility and holiness are not optional, Guernsey said. "Our lives must show forth the character, the holiness of the Lord himself." "No matter what external problems we tend to blame, we are always our own number one problem. The path to holiness begins with a greater realization of our own sinfulness and brokenness," he said. "Holiness cannot be manufactured. It cannot be produced by our own human striving in the flesh. Holiness must be the work of the Holy Spirit in you. And that demands surrender, a total abandonment of our spiritual ambitions," said Guernsey, who served 29 years as rector of All Saints' Church in Dale City, Va., before taking other posts in the denomination. He was elected to his present post in 2011. Regarding dependence on the Lord, Guernsey pointed out that in the scripture Jesus explains that the 72 are not to move around from house to house looking for nicer accommodations or better food. In today's context, He might be advising clergy to stay off the career ladder, "moving on from church to church looking for a larger flock and better pay." "For those who follow Jesus' call, the challenge is always to trust and obey," Guernsey said, adding that "Faith" is often spelled "R-I-S-K."
And fifth, one's mission must be Spirit-filled and Spirit-empowered. Entirely too much of the church as known by many today is busy, organized and productive, but lacking the supernatural power of God to change lives, he said. "Far too often we have put our emphasis on structure and programs instead of offering the transforming, life-giving presence of Jesus." "But thanks be to God for ministers who know the Holy Spirit and eagerly expect the Lord to move in power through them to touch and transform lives." Following Guernsey's remarks and a prayer of consecration by Anderson University School of Theology dean emeritus James Earl Massey, the new graduates received individual blessings from each Beeson faculty member. Combining commencement and consecration, explained Beeson dean Timothy F. George, brings together Beeson's purpose as a place of faith and learning. "One dimension apart from the other is incapable of preparing men and women for the service of the church," George said. In addition to their diplomas, each graduate received a copy of the Holy Scriptures. In honor of the Class of 2014, the school also is sending a shipment of Bibles in the Arabic language to an Unreached People Group in North Africa, where two Beeson graduates currently serve in ministry. This year's class included two Master of Arts in Theological Studies graduates, 14 Master of Divinity degree graduates and one Doctor of Ministry graduate. On Tuesday, May 5, Beeson presented its annual student awards for the 2013-14 academic year. Honorees were Anthony Tyshawn Gardner, most distinguished student; Johnathan Harris, Biblical languages award; David Tew, history and doctrine award; Darrell Cook, pastoral ministry award; and Kevin Johnson, preaching award. The Beeson graduation was the first of seven Samford commencement programs this month. Graduates in Samford's schools of pharmacy, business, health sciences, law, arts and sciences, and education and arts will receive degrees during exercises in Wright Center May 16 and 17.